Originally Submitted to FurAffinity.net on Oct 17th, 2013 02:10 PM. Before it was transferred to Inkbunny it had 33 views and 4 favorites. So here's a fun fact. There was a time when Ibun wasn't my only character. 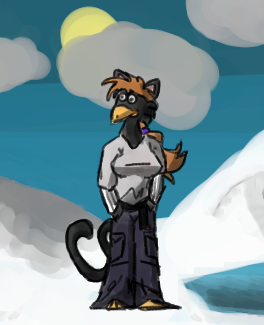 This is Bethanie, a hybrid penguin/cat. Why penguin? I dunno, I always described Ibun's fur pattern as being penguin-like, so I kinda ran with that idea. It's been ages; I know a few people who will probably remember her, at least.